B-Click PUR Metatarsal S3 Boot has a 4 D-ring fastening for a secure fit while the shock absorbing heel provides all day comfort. It has steel toe caps and a steel midsole for protection from any falling or sharp objects. It includes anti-static properties, water resistant upper along with an oil and heat resistant outsole. Ideal for welding with a protective tongue to sit over laces preventing fire hazards. Conforms to EN ISO 20345:2011 S3 SRC safety standards. Designed to provide superior protection and comfort to the user throughout the work day. Very lightweight construction allowing the user to move freely and with ease. The 200 Joule steel toe cap does a great job of protecting the user from all sorts of impacts. Lined with breathable water resistant materials making these boots ideal for outdoor work. Beeswift TBBR Traxion Brown Safety Work Boot conforms to EN ISO 20345:2011 S3 SRC Safety Standards. Manufactured with a water resistant leather upper keeping the users feet dry. Oil resistant soil prevents/lowers the chances of any slippages. Provides exceptional protection from impacts with a 200 joule steel toe cap & steel midsole. Keeps the users feet warm with 3M Thinsulate lining. Beeswift Ctf28 3M Thinsulate Lining Rigger Boot conforms to:EN ISO 20345:2011 S3 SRC safety standards. Non-woven polypropylene disposable coats, ideal for visitors. 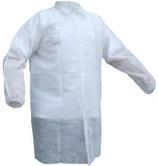 Click Once White Polypropylene Disposable Coat comforms to EN340 safety standard. Pack of 20 Disposable Coats. Manufactured from a combination of 65% polyester and 35% cotton, soft Polycotton blend ensures comfort and durability. Designed with a secure concealed stud front fastening system. Elasticated sides and waist for improved product security and comfort. Suitable to wear under your everyday clothes. 2 breast pockets with stud flap. 2" (5cm) waistband with side elastic bands. Manufactured from a mixture of 65% polyester & 35% cotton. Elasticated waist, cuffs & ankles for an improved secure and comfortable fit. Comes with an attached hood for extended protection from rainwater. Designed with a concealed zip front fastening system. Manufactured from 100% fire resistant treated cotton, for maximum comfort and protection. The Nordic patterned hi visibility strips provide exceptional visibility night or day. Designed with many different pockets suitable for carrying all sorts of valuables and tools. The kneepad pockets are compatible with all generic kneepads lowering the level of strain on the users knees. Conforms to EN ISO11611:2007 & EN ISO11612:2008 Safety Standards. Beeswift Trousers with elasticated waist, through access pockets and adjustable stud fastening at ankle. Manufactured with lightweight Nylon for exceptional comfort. Elasticated waist improves the overall security and comfort of the product. The seams have been fully taped preventing any liquids getting through. Beeswift NBDTN Nylon Atlantic Navy Trouser conforms to: EN 343 3:1 safety standard. Manufactured from high quality waterproof materials. Easy access Zip away concealed hood. Underarm ventilation keeping user cool and dry. Secure fit with a comfortable elasticated waistband. Adjustable hem at legs and cuffs. Beeswift B-Dri Nylon PVC Waterproof Rainsuit is perfect for all outdoor ventures and Conforms to: EN 343 3:1 standard. Adjustable hem at legs and cuffs, Lower front pocket with flaps. Perfect for all outdoor ventures. Fabric: Lightweight Nylon with PVC coating. 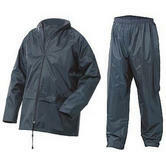 Beeswift B-Dri Nylon PVC Wetwear Rainsuit conforms to: EN 343 Class 3:1 standard. Manufactured from 100% cotton for superior user comfort. Button waistband faseting system with a brass zipper for imporved product security. Designed with belt loops if, for additional and improved fit & security. Conforms to EN531 & EN470 Safety Standards. Ideal for wearing under other clothing during cold weather conditions. Keeps the user nice and warm whilst still allowing the body to breathe. Designed with comfort in mind, sitting close to the body making it virtually unnoticeable. Perfect for outdoors or cold environments. This Beeswift THVSS Thermal base layer provides the user with an additional source of warmth while still allowing the body to breath. A comfortable fit, Suitable to wear under your everyday clothes. Manufactured with a polycotton outer, providing both comfort and durability. Practical bodywarmer will keep you warm and offer total functionality. Secure fit with a zip front complete with a studded storm flap. Designed with several pockets capable of holding all sorts of valuables and tools. The elasticated hem allows for a smooth and comfortable fit. PU coated outer for improved resistance to rain and rough weather conditions. Polycotton lining makes this bodywarmer both comfortable and durable. Designed with 2 zipped pockets on both sides to hold valuables & tools. Beeswift BWENG Reversible Hi Vis Orange Bodywarmer conform to: EN ISO 20471 Class 2 high visibility GO/RT 3279 Safety Standards. Manufactured from a Polycotton mixture for both comfort and durability. The jacket is Teflon coated for improved resistance to soils. Highly visible reflective tape across arms chest and lower body. Two breast pockets with flaps and Two hip pockets. Beeswift RSJ Polycotton Hi Vis Orange Jacket conforms to RIS-3279-TOM - Railway use certified & EN ISO20471 2013 Class 3 High Visibility safety standards. Fully Waterproof design ideal for outdoor ventures. PVC Coated Polyester material providing a durable product. Stronger frame due to the Fully Taped Seams. Neat and tidy concealable hood Hood, easy to access. Great quality, lightweight waterproof jacket Materials: Lightweight nylon with PVC coating on inside. Beeswift B-DRI NBDJN Unisex Waterproof Jacket conforms to: EN343, Class 3:1 standards. Manufactured with a heavy PU coated polyester material. The interior lining is quilted with a polyester filling for improved comfort and durability. With an easy access concealed hood to provide additional protection against rain. Highly visible design with retro-reflective tape in various areas. Designed with multiple pockets ideal for holding alll sorts of tools and valuables. Conforms to EN ISO 20471 Class 3 & EN343 Safety Standards. Manufactured with heavy duty PU coated polyester ensuring a durable product. The wilted lining allows the user to stay comfortable whilst at work. Secure fit with a two heavy duty zip front fastening system. Designed with multiple different pockets ideal for holding all sorts of valuables and tools. Highly visible with retro-reflective tape providing a class 3 high visibility grade. Beeswift TJSTTENG Hi Vis Nylon Lined Jacket conforms to EN ISO 20471 Safety Standards. High quality hooded sweatshirt from Beeswift. Very good looking sweatshirt in High visibility yellow colour. This super comfortable sweatshirts made from 280gsm fleece fabric and added hood. For more visibility and security in your work place it comes with 3M reflective tapes, which Conforms to European Hi-Vis PP standard EN471 Class 3. Beeswift is a range of highly functional workwear and PPE. Beeswift is the manufacturer of the most recognized trade and retail brands include B-BRAND, B-SEEN, B-DRI and CLICK. Beeswift Workwear specialist safety ranges and hazard protection workwear conform to the highest EU levels of quality and standards. Most of these products meet the strictest quality and safety standards. At North Sea Workwear we have a large stockholding of hi-viz clothing, personal protective equipment (PPE), safety footwear, protective work gloves and much more.